The hottest trend in men's wedding attire has us blue all over! New blue, bright blue, new navy, or cobalt blue – whatever you call it the blue suit is a trend not to be missed for 2017…and beyond. The trend towards brighter blue suit has been percolating for a few years now but seems to be really hitting its stride this summer. We saw bright blue suits and tuxedos at this year’s Grammys and Oscars and we see them worn daily and weekly by news anchors and sports casters all over television. This fresh, modern look is now making its way into weddings and wedding parties. And we love it! We love it because it finally gives the grooms a slightly brighter spotlight on their big day. The bright blues are also fun to accessorise with blush pinks, orange and some shades of purple giving lots of options for matching or complementing bridesmaid dresses or wedding colors. 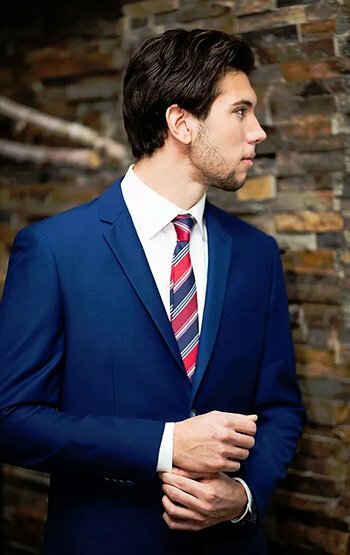 The brighter blue suits are also easy to wear for work or for other events making them a great investment piece for the long term. So here is to being bold and stepping out in bright blue for your big day. Find this blog post on Bourbon & Bloom where we guest blogged it!